Private departures available for groups of 8 or more. Food, community, and the land are inextricably entwined in southern France. On this foodie journey, we explore scenic landscapes from the Riviera’s sunny coast to Provence’s mountain villages and become attuned to local culinary traditions and terroir. We’ll learn to cook regional specialties and taste the combined effects of earth and climate in oil pressed from a single farmhouse’s olives, in chèvre from mountain-grazed goats, and in honey from lavender-pollinating bees. All the enticing foods and wines we encounter on this trip possess a distinct flavor and character that have influenced the area’s culinary culture for centuries. Our gastronomic adventure begins in Nice, a city with a food style and flavor recognized as completely separate from other French cuisine. In Haute Provence, we’ll experience more robust dishes influenced by the mountain climate. 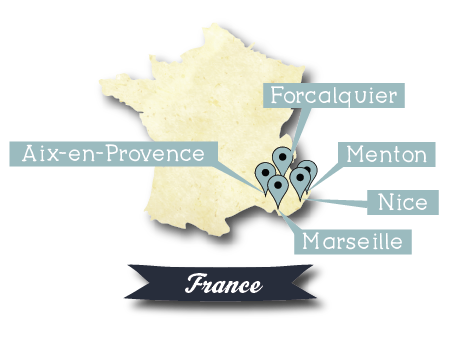 We’ll follow our taste buds to delightful Aix-en-Provence, then on to Marseille with its Mediterranean fish market and bouillabaisse. As we roam, our partner Viktorija Todorovska—who writesabout the food of Provence and Nice—shares her passion for exquisite wines (including rosé, a southern-France art form) and introduces us to chefs, farmers, and fishermen who create the local flavors we’ll savor and learn to cook. Nice’s sherbet-hued buildings and pretty beach welcome us to the French Riviera, and we’ll join the locals in promenading along a beachside path. Flower and food markets add further color to our journey, and a cooking class introducing Nice’s unique culinary traditions will whet our appetites. Other highlights include sampling Nice’s savory street foods and tasting wine at a local bar where the Niçois language is spoken. On Day 3, we’ll venture along the coast to Menton—famous for its sweet, aromatic lemons—and eat traditional mountain fare at a cliffside village in the Maritime Alps. We’ll also try our hand at pétanque, a Provençal game of throwing metal balls, while we sip a pastis, theanise-flavored aperitif. Provence’s vineyards call, and we answer by tasting wines from the Côtes de Provence and Coteaux d’Aix-en-Provence appellations. Scientists at the Research Center for Rosé give us an understanding of Provence’s signature drink. But wine’s not the whole story; we’ll also enjoy Provence’s pasture-raised Sisteron lamb and participate in a cooking class at a country house using oil from its own olive grove. On our June departure, we’ll explore the center of Provence’s lavender production, where endless purple fields greet the eye. On the October trip, we’ll meet a chèvre producer (and his goats) and taste Provence’s most famous goat cheese: Banon. In the same landscape that inspired Van Gogh and Cézanne to paint, vintners explain how altitude, sunlight, soil, and mistral winds create the perfect climate for wine grapes—and treat us to a glass of rosé. We’ll meander through Aix-en-Provence, appreciating the city’s fountains and indulging in calissons—almond-paste sweets flavored with candied fruit or lavender. Later, we’ll taste a variety of chèvre de Provence expertly paired with local wines during a light dinner. At Marseille’s vibrant Old Port fish market, we’ll blend into the crowd of cooks who pick the freshest fish right off the boat for making bouillabaisse, Marseille’s signature dish. Later, we’ll savor the flavorful soup at a restaurant renowned for this specialty. A walking tour of Panier—the old, working-class neighborhood that’s home to many artists—leads us to an urban winery specializing in artisanal “micro-cuvées” from grapes grown just outside the city. Depart from Marseille for your trip home or for other destinations within France. For a deeper look into the cuisine of Provence, please see Viktorija's book: http://amzn.to/10rGIrs.